Over the last week we have received multiple emails from Microsoft letting us know that our apps Timezone Converter, XKCD Viewer and Convert My Units have been featured in the Windows Phone Store (see screenshot below of Convert My Units). The free exposure has been nice and getting an endorsement from Microsoft on the quality of our apps feels great too. 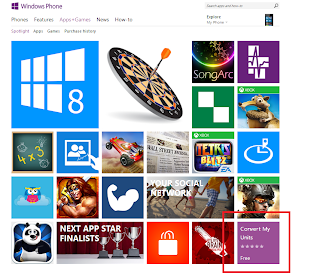 Click here to see the factors that Microsoft use to determine which apps will be featured on their store.